Harvard historian Niall Ferguson says Princeton economist Paul Krugman takes Keynes a bit too seriously. As readers of this blog know, I have long been an advocate of Pigovian taxes, such as carbon taxes to deal with global climate change. (Here, also here ungated, is my most complete statement of the arguments.) On this topic, I was disappointed with the Bush administration, which did little to address the issue. Their failure to act, while disappointing to me, was nonetheless principled and thoughtful. The logic for not doing much to address global climate change is spelled out in a recent blog post by former NEC director Keith Hennessey. 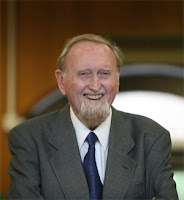 Clive Granger, the great econometrician and Nobel laureate, has died. Here is his obituary. 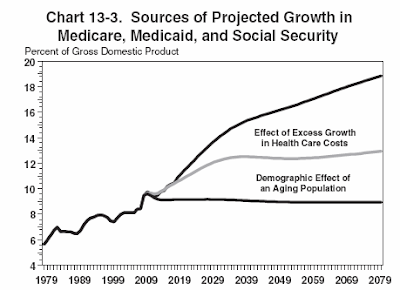 The graph is from the Donald Marron's new blog. I'm surprised to [see] the strong utilitarian view described as the consensus. I don't know much about utilitarian optimal tax theory, but I also don't know of any public finance or policy people who are dying to revive the prescriptive insights of Jeremy Bentham and Francis Edgeworth. Is there a cult of utilitarian social planners out there waiting to propose taxes on inputs like height, intelligence and race? Well, no, to my knowledge no one is eager to tax height, intelligence, and race. But there is a prominent guy who lives at a nice home at 1600 Pennsylvania Avenue who wants to "spread the wealth around." The moral and political philosophy used to justify such income redistribution is most often a form of Utilitarianism. For example, the work on optimal tax theory by Emmanuel Saez, the most recent winner of the John Bates Clark award, is essentially Utilitarian in its approach. The point of our paper is this: If you are going to take that philosophy seriously, you have to take all of the implications seriously. And one of those implications is the optimality of taxing height and other exogenous personal characteristics correlated with income-producing abilities. A moral and political philosophy is not like a smorgasbord, where you get to pick and choose the offerings you like and leave the others behind without explanation. It is more like your mother telling you to clean everything on your plate. If you are a Utilitarian redistributionist, the height tax is like that awful tasting vegetable your mother served up because it is good for you. No matter how hard you might wish it wasn't there sitting on your plate, it just won't go away. fixing compensation should be the responsibility of corporate boards of directors and, in particular, of their compensation committees. These boards, I'll remind you (and please remind the board members), are supposed to represent the interests of stockholders, not those of managers. Quite plainly, many were asleep at the switch, with disastrous consequences. The unhappy (but common) combination of coziness and drowsiness in corporate boardrooms must end. As one concrete manifestation, boards should abolish go-for-broke incentives and change compensation practices to align the interests of shareholders and employees better. For example, top executives could be paid mainly in restricted stock that vests at a later date, and traders could have their winnings deposited into an account from which subsequent losses would be deducted. Boston Magazine looks at the university's financial woes. 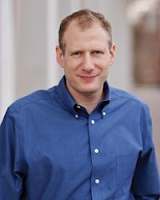 The Crimson reports that after 22 years, Marty Feldstein is leaving the AIG board of directors, where he served "on the board’s finance and risk management committee as well as the regulatory, compliance, and public policy committee." This will give Marty more time for his work on President Obama's economic advisory panel. 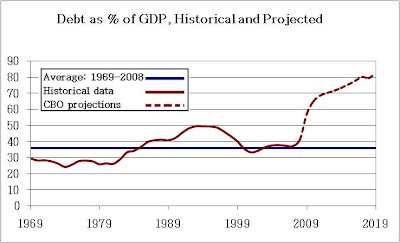 The recommended future policy setting of the funds rate based on the estimated historical policy rule and these economic forecasts is given as the dashed line in Figure 2. This dashed line shows that, in order to deliver a degree of future monetary stimulus that is consistent with its past behavior, the FOMC would have to reduce the funds rate to -5% by the end of this year—well below its lower bound of zero. Says Georgetown economist Ted Gayer. 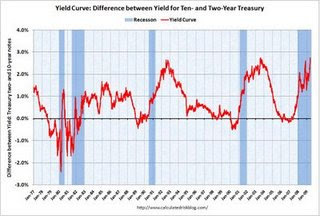 I once wrote a short paper called The Savers-Spenders Theory of Fiscal Policy based on the premise that there are two types of people: Some save and intertemporally optimize their consumption plans, while others live paycheck to paycheck, spending their entire income as soon as it's received. Sometimes readers of the paper think of the two groups as rich and poor, but that interpretation is wrong. Some people with low incomes manage to scrimp and save (I always think of my grandmother), and some people with high incomes spend most everything they earn. On her financial disclosure report for 2007, she said her only financial holdings were a Citibank checking and savings account, worth $50,000 to $115,000 combined. During the previous four years, the money in the accounts at some points was listed as low as $30,000. My grandmother would have been shocked and appalled to see someone who makes so much save so little. Update: Several readers have emailed me to suggest that Judge Sotomayer does not need to save much because federal judges have generous retirement benefits. Maybe so. And, in any event, economic theory alone does not prescribe what the right level of saving should be: Optimal saving is a function of the subjective rate of time preference, and economists have no basis to say that some intertemporal preferences are better than others. In my savers-spenders model, both savers and spenders may be acting optimally given their own preferences. I am sure, however, that none of these arguments would have convinced my grandmother. Update 2: A couple other readers have pointed out a possible problem with the Washington Post story I cited above. To quote from one email, "Under the Ethics in Government Act of 1978, federal judges are not required to report publicly amounts they have saved in their Thrift Savings Plan (5 U.S.C. app. sec. 102(i)(1)(A)). The Thrift Savings Plan ("TSP") is the federal employee's version of a 401(k) plan. Of course, Judge Sotomayor may not have saved much in her TSP. On the other hand, she may have saved several hundred thousand dollars that way. The point is that the TSP need not be disclosed under the law, so there is no way the Washington Post could have reported on it." Update 3: Ten days later, based on new documents filed by the nominee, the NY Times reports: "So how is it that Judge Sonia Sotomayor...reported a net worth of just $740,000 this week, with no stocks or bonds and a savings account of $31,985, just marginally more than she owes her dentist and credit card companies?...Besides living in an expensive area of the country, Judge Sotomayor has a taste for nice things and is an avid traveler. Her destinations have ranged from the Caribbean to the Galápagos Islands, and she has been known to stop in at a casino on vacation....Judge Sotomayor has been described in interviews as an interior decorating buff who loves to shop. And she is a frequent patron of Manhattan restaurants, sometimes picking up the tab for dinner with clerks in SoHo or at Chinatown places like Joe’s Shanghai." Some observers have asserted that domestic producers that provide health insurance to their workers face higher costs for compensation than competitors based in countries where insurance is not employment based and that fundamental changes to the health insurance system could reduce or eliminate that disadvantage. However, such a cost reduction is unlikely to occur, except in the short run. The equilibrium level of overall compensation in the economy is determined by the supply of and the demand for labor. Fringe benefits (such as health insurance) are just part of that compensation. Consequently, the costs of fringe benefits are borne by workers largely in the form of lower cash wages than they would receive if no such benefits were provided by their employer. affected by a change in the health care system. As a result, cash wages and other forms of compensation would have to rise by roughly the amount of the reduction in health benefits for firms to be able to attract the same number and types of workers. Compensation could take some time to adjust to its market-clearing level (the point at which supply and demand are equal). During that time, firms that formerly provided health benefits—especially firms that employ workers under multiyear contracts—could experience substantial reductions in labor costs, which would boost their profits temporarily. But those firms would experience no permanent change in their competitive status. Be ready: This fallacy may well be rearing its ugly, and illogical, head in the days to come. I have recently started the process of buying a car (to be used, primarily, by my teenage daughter and, in a couple years, my older son). Like every conscientious consumer, I have been doing a bit of research. In particular, I got a copy of the Consumer Reports auto issue (April 2009). Andrew Leonard notes, as some others have, that in the new Star Trek movie, young Vulcans are taught the meaning of "excludable" and "rival." I am delighted to see economics education thrive into the 23th century. I am, however, not surprised: After all, it is only logical. Leonard suggests that the reference in the movie is a shout-out to Paul Romer's work. Maybe so, but that is less obvious to me. Paul certainly used the terms "excludable" and "rival" in his famous work on economic growth, and to great effect, but these terms predate Paul's work. Indeed, they are the standard terms that public finance economists have long used to distinguish private and public goods. Today at Harvard, most students first learn these words when studying the basics of public finance rather than the theory of long-run growth. I won't venture a guess about the Vulcan curriculum. By the way, the Star Trek movie is a lot of fun. I thought you would appreciate this. My daughter likes doing her homework in my office but she needs a flat surface on which to write. She perused all the textbooks in my office and decided she liked your macro book best as her writing surface. Now she won't use any other book and won't do her homework in my office if we can't find your book. So now you have another reason to recommend your macro text! I am not at all sure how to interpret this finding. It sounds like either the women's movement was a mistake or subjective happiness is not the right objective. From OMB (page 191). Thanks to Andrew Biggs for the pointer. Robert Samuelson looks at the President's fiscal policy. How did cap and trade, hatched as an academic theory in obscure economic journals half a century ago, become the policy of choice in the debate over how to slow the heating of the planet? And how did it come to eclipse the idea of simply slapping a tax on energy consumption that befouls the public square or leaves the nation hostage to foreign oil producers? The answer is not to be found in the study of economics or environmental science, but in the realm where most policy debates are ultimately settled: politics. Many members of Congress remember the painful political lesson of 1993, when President Bill Clinton proposed a tax on all forms of energy, a plan that went down to defeat and helped take the Democratic majority in Congress down with it a year later. During the campaign, candidate Obama had the edge over candidate McCain on this issue because he favored auctioning off all the permits. Sadly, the Congress seems to have now rejected this position. I wonder: Will the President now fight for his admirable campaign position? Or will he cave into the special interests to get a bill passed, even if it is highly flawed? This week confirmed two important facts -- that health-care costs are the key to our fiscal future, and that even doctors and hospitals agree that substantial efficiency improvements are possible in how medicine is practiced....If we can move our nation toward the proven and successful practices adopted by lower-cost areas and hospitals, some economists believe health-care costs could be reduced by 30% -- or about $700 billion a year -- without compromising the quality of care. This may all seem academic, but this week a stunning thing happened: Representatives from some of the most important parts of the health-care sector -- doctors, pharmaceutical companies, hospitals, insurers and medical-device manufacturers -- confirmed that major efficiency improvements in health-care are possible. They met with the president and pledged to take aggressive steps to cut the currently projected growth rate of national health-care spending by an average of 1.5 percentage points in each of the next 10 years. By making this pledge, the providers and insurers made clear that they agreed the system could remove significant costs without harming quality. Ed Andrews, one of many diligent Washington reporters I got to know a bit when I was at the CEA, tells the story of his own problems with debt and delinquent mortgages. Update: Another side of the story. The stimulus bill Congress passed a few months ago apparently requires the Council of Economic Advisers to report quarterly on the employment effects of the act. That job is, essentially, impossible. Because we have only one economy, there is no way to know for sure what would have happened without the stimulus bill. It is like asking a doctor, "How much sicker would this particular patient have been if you had not given him treatment up to now?" You can get, as an answer, the doctor's subjective professional judgment, but you cannot expect objective measurement. SENIOR ADMINISTRATION OFFICIAL: That would certainly be one of the things that we'll be looking at. The other thing we'll definitely be checking are the spend-out assumptions, because certainly our estimates have been based on what we -- how we thought the program was going to spend out. That's something we'll need to check. The other thing that's going to be so nice about getting the direct reporting, right, so we can try to say, here's what we thought we were going to get, and when we get the numbers back, how do they compare? It will inherently be at -- you know, it'll be a two-way test. There are issues involved in how good the numbers we get back are going to be, and it will also be a test of what we were assuming about multipliers. And so, absolutely. One of the things that I try to emphasize in the reports -- because we haven't yet even had to face a report to Congress -- is, we're going to do it lots of ways but I think -- to make sure that we've covered all our bases, we're going to try estimating it one way, we'll look at the direct numbers, we'll try some different multipliers, we'll be looking at other studies, we'll be doing some microeconomic analysis to see if, you know, a county had a whole lot of government spending; does it show up in the county employment data? We're just planning to very much go on all fronts to get as complete a picture of what this Act is doing as we possibly can. Here is the question I would have asked: "Going forward, what macroeconomic data would you have to observe before you concluded that the stimulus bill has been a failure? Or will you conclude, no matter how bad things get, that the economy would have been in even worse shape without the stimulus? And if the latter is the case, aren't these quarterly reports just a bit surreal?" * health care worker unions — the Service Employees International Union (”SEIU”). "[T]hese groups are coming together to make an unprecedented commitment. Over the next 10 years — from 2010 to 2019 — they are pledging to cut the rate of growth of national health care spending by 1.5 percentage points each year — an amount that’s equal to over $2 trillion." This is one of the sillier White House announcements I have seen. Let me draw a sports parallel. Imagine if the mayor of your nearest big city were to hold a press conference with the General Manager of the city’s Major League Baseball team. The Mayor announces that the GM, working with the coaches and players, has committed that he will work to develop plans for the team to hit the Mayor’s new goal of winning 40 more games this season than they otherwise would have won. Those plans will improve the team’s hitting, pitching, and fielding. The Mayor also announces that the manager’s plans, combined with the Mayor’s new policy initiative for better parking at the stadium, will make fans happier and help the team win more games. What do you mean the GM “will develop plans”? Doesn’t he have any specific plans yet? How will he improve hitting, pitching, and fielding? How are we supposed to verify that the team won 40 more games than they otherwise would have, since we will never know how many games they would have won? Other than picking the number 40, why is the Mayor involved in this press conference? What does the Mayor’s new parking initiative have to do with the coaching changes, and how will the new parking initiative help the team win more games? If this is such a good idea, what has changed to make it happen now? Is the Mayor claiming that his persuasive powers alone are worth 40 more wins? Why didn’t the GM make these changes before? In an old post, How do the right and left differ?, I wrote, "The right sees competition as a pervasive feature of the economy and market power as typically limited both in magnitude and duration. The left sees large corporations with substantial degrees of monopoly power that need to be checked by active antitrust policy." President Obama’s top antitrust official this week plans to restore an aggressive enforcement policy against corporations that use their market dominance to elbow out competitors or to keep them from gaining market share. The new enforcement policy would reverse the Bush administration’s approach, which strongly favored defendants against antitrust claims. 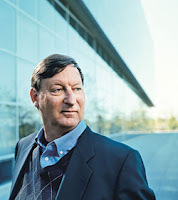 It would restore a policy that led to the landmark antitrust lawsuits against Microsoft and Intel in the 1990s. This is precisely what worries me. In my judgment, the Microsoft case was a policy error, and I fear that a more activist antitrust policy will mean more errors of this sort. Yesterday's Washington Post has a nice feature article on Aplia, the educational software firm founded by economist Paul Romer. I have never used the Aplia product in my courses at Harvard, but I know professors at other schools who have tried it, and they love it. It is available to be used in conjunction with my Principles text. My other textbook Macroeconomics, which comes out in a new edition on July 15, 2009, will be the first intermediate macro text to have an Aplia product to accompany it. I have been told that the Aplia intermediate macro product will be available for Spring 2010 courses. As of earlier this morning, that is the number of visitors who have stopped by this blog. 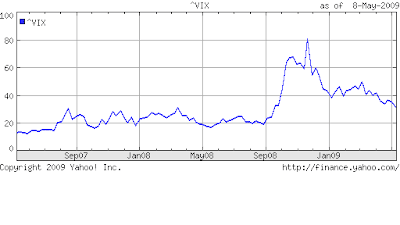 The VIX index, which uses option prices to measure expected stock market volatility, has fallen off substantially. This is surely good news. Conor Clarke says my livelihood is in peril. It is true that there is always entry into the textbook-writing business, which puts incumbents like me at risk. But I am not worried. 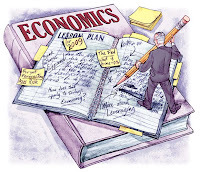 I am one of the economics profession's leading producers of textbooks, I have an extensive network of dealers (aka professors), and I have friends in high places (Larry Summers, Christy Romer). So doesn't all this make me precisely the kind of too-big-and-too-interconnected-to-fail plutocrat that, if push comes to shove, will get a government bailout? If you doubt me, let me point out that my initials are GM. Removing the zero lower bound on nominal interest rates would represent a valuable addition to the policy arsenal of the central banks. We know something about how interest rates work. There is no reason to believe there would be any dramatic change in the effectiveness of policy rate cuts if these cuts to the rate [are to a] level below zero. We know next to nothing about the effectiveness of the alternative policies that central banks are forced to adopt if they don’t just want to sit on their hand[s] once the[y] hit the zero lower bound: quantitative easing and credit easing, relaxing the collateral requirements for central bank lending etc. I should note that, economic logic aside, the "optics" of negative interest rates are not very good. I received more hate mail from my NY Times article on the topic than from anything else I have ever written. Indeed, Harvard University President Drew Faust received several emails suggesting that I be fired for writing the piece. She graciously copied me on her replies, which noted that Harvard faculty are not sacked for espousing controversial ideas. Central bankers, however, do not enjoy the same luxury. Good news for Harvard. Marc Melitz has decided to accept the offer to return to our economics department. I am delighted. Here is one summary of the rightly famous Melitz model of international trade. Cliff Asness, whose firm manages some $20 billion of assets, has written an open letter blasting President Obama for his attack on the hedge fund industry in the wake of the Chrysler bankruptcy. As you'll recall, hedge funds, which hold approximately $1 billion in Chrysler bonds, refused the government's offer to take approximately thirty cents on the dollar. Obama accused hedge funds of holding out "for the prospect of an unjustified taxpayer-funded bailout." "Let’s be clear, it is the job and obligation of all investment managers, including hedge fund managers, to get their clients the most return they can. They are allowed to be charitable with their own money, and many are spectacularly so, but if they give away their clients’ money to share in the “sacrifice”, they are stealing." "The President screaming that the hedge funds are looking for an unjustified taxpayer-funded bailout is the big lie writ large. Find me a hedge fund that has been bailed out. Find me a hedge fund, even a failed one, that has asked for one. In fact, it was only because hedge funds have not taken government funds that they could stand up to this bullying. The TARP recipients had no choice but to go along." "The President's attempted diktat takes money from bondholders and gives it to a labor union that delivers money and votes for him. Why is he not calling on his party to "sacrifice" some campaign contributions, and votes, for the greater good? Shaking down lenders for the benefit of political donors is recycled corruption and abuse of power." Alan Viard explains why, if a cap-and-trade system to regulate carbon is adopted, the permits should be auctioned. A friend alerts me to a useful summary of how events have unfolded during this crisis. If you are looking for a short piece to assign undergraduate classes, this is a good choice. Should the U.S. government tax corporate income from overseas? The Obama administration is rolling out details Monday of what aides are calling a far-reaching crackdown on offshore tax avoidance, targeting many U.S.-based multinational corporations and wealthy individuals. President Barack Obama will flesh out a proposal included in his February budget blueprint seeking to curb the practice of parking foreign earnings in offshore tax havens indefinitely. By some estimates, $700 billion or more in U.S. corporate earnings have accumulated in overseas accounts in recent years. The plan to be announced Monday will go further. It aims to change the legal treatment of offshore subsidiaries and structures that companies have used to avoid not only U.S. taxes, but taxes in other developed countries as well. Tax policy toward American multinational firms would appear to be approaching a crossroads. The presumed linkages between domestic employment conditions and the growth of foreign operations by American firms have led to calls for increased taxation on foreign operations - the so-called end to tax breaks for companies that ship our jobs overseas. At the same time, the current tax regime employed by the U.S. is being abandoned by the two remaining large capital exporters - the UK and Japan - that had maintained similar regimes. The conundrum facing policymakers is how to reconcile mounting pressures for increased tax burdens on foreign activity with the increasing exceptionalism of American policy. This paper address these questions by analyzing the available evidence on two related claims - i) that the current U.S. policy of deferring taxation of foreign profits represents a subsidy to American firms and ii) that activity abroad by multinational firms represents the displacement of activity that would have otherwise been undertaken at home. These two tempting claims are found to have limited, if any, systematic support. Instead, modern welfare norms that capture the nature of multinational firm activity recommend a move toward not taxing the foreign activities of American firms, rather than taxing them more heavily. Similarly, the weight of the empirical evidence is that foreign activity is a complement, rather than a substitute, for domestic activity. Much as the formulation of trade policy requires resisting the tempting logic of protectionism, the appropriate taxation of multinational firms requires a similar fortitude. In today's NY Times, Allan worries about inflation, while Paul worries about deflation. Update: The debate continues here and here. Click here to try ESPlannerBasic, a financial planning program developed by BU economist Larry Kotlikoff. 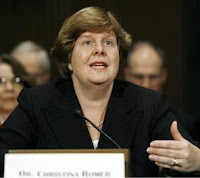 Click here to read Christina Romer's testimony in the front of the Joint Economic Committee yesterday, entitled "The Economic Crisis: Causes, Policies, and Outlook." ...business is good for the economics profession. "There is no unemployment among Ph.D.'s in economics," declares John Siegfried, a Vanderbilt University professor. Just do the math, and you'll see why: In the current academic year, the American Economics Association has listed approximately 2,200 job openings worldwide—but U.S. universities will grant only 950 Ph.D.'s in economics. Universities themselves may cut back, but economists remain in demand in government, business, and nonprofits and as consultants or policy analysts.